In March the International Human Rights Clinic of Harvard Law School‘s Human Rights Program (HRP) issued an indictment of the failings of Guyana’s gold mining regime and its adverse impacts on Amerindians in that country. With a catchy name like “All That Glitters,” the report’s PR caught the attention of several bloggers and regular media for a few days, then faded away. Judging from what they wrote, most never read the full report, but rather stuck to the press release. I decided to hold off because my own familiarity with the gold mining industry in Guyana was very limited (I am more familiar with the garimpeiros of Brazil). I preferred reading it cover-to-cover before deciding whether to blog about it and/or add it to the Temas Reading List section on mining, even if that meant weeks passing before I did so. I’ve now read the report and it’s pretty good — certainly good enough to be added to the Reading List. The report is well-organized, logically and well-written, and is easy to read (this last point no small miracle when dealing with a group of lawyers and law students!). Their diagnosis of the Guyanese mining regime and systemic ills seems thorough and well thought-out, and most of their policy recommendations sound. In fact, I only really have three minor complaints about the report. The first is that I would have preferred a bit more empirical weight behind the report, but I understand the difficulties in getting such research done in places such as Guyana — particularly its wild-and-woolly interior — and since this report fills many gaps in up-to-date literature about Guyanese mining and land-use, it’s very welcome despite this limitation. Second, I was at times uncomfortable with the constant focus on this problem mostly, if not entirely, through the lens of how it impacts Guyana’s Amerindians and their human rights. I understand this too — after all, this is a report by Harvard’s human rights program, not its environment or mining projects. And perhaps the focus on protecting the rights of indigenous groups is the best available political lever to force true change in Guyana’s mining sector. Certainly this is at least the second international report I know of to take this approach (and this one presents a more taut, well-written case for it than its predecessor). I guess I just feel, as a blogger on environmental and health issues, that not every impact and solution had to be bent through that lens — that the environmental and health problems identified deserve full attention on their own, regardless of whether they affect Amerindians nearby. Third, every once in a while the report would depart from commendable specificity to suddenly become maddeningly vague about a key point. For example, the report repeatedly calls for the 2005 Mining Regulations to be fully and effectively implemented. What does that mean? I have my own theories, but I would prefer that the authors specify what criteria they would use to adjudge that full and effective implementation has occurred. They have been specific on many if not most other key points — why vague here? mosquito infestation (due to the new standing, stagnant bodies of water created by miners) and malaria. Although the report confesses that a comprehensive assessment of the social impacts of such mining was beyond the scope of their study, they pass on the impacts mentioned by various parties consulted during the course of the study (and are thus unverified): mining is correlated with increased prostitution, HIV infection rates, violence against women, and international and domestic trafficking in persons (TIP). Although the Mining Regulations were improved through amendments made in 2005, the report complains that they have yet to be effectively implemented (whatever that means!). And while an improvement over the pre-2005 regime, they still have significant failings. First, they do not regulate meaningfully the use of mercury. Second, while they say a miner is responsible for environmental damage from “normal mining activities carried on in the area where his operation is legally permitted”, they do not spell out what this responsibility entails and are not clear about whether this applies to small-scale miners. 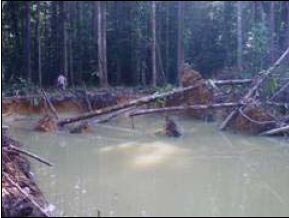 Enforcement is woefully inadequate, declares “Glitters,” and it may not only be costing Guyana in environmental damage terms, but also in loss of revenue — it is estimated that anywhere from 30 to 80% of tax revenues owed the government from gold mining operations currently are not collected. There are only 11 inspectors expected to check on thousands of mining operations throughout the country, and whose inspection and administrative tasks are so numerous and time-consuming that completing even a fraction of what is expected of them would be humanly impossible. Yet they are paid only about US$270 a month, barely above the cost of living and far less than the current market price for an ounce of gold. It is no small wonder, then, that they are tempted to take bribes, and field reports gathered by the Harvard team indicate that they are indeed corrupted. In any case, the report found that mine operators find it to be relatively easy to evade many of the monitoring and enforcement strategies currently employed by the mining inspectors. The 2005 mining regulation amendments place more stringent restrictions on medium-sized mining operations, but did little to prevent such operations from trying to operate under small scale licenses in order to escape them. This has led to the paradox that Guyana’s single large-scale mining operation, Omai, has been closely watched since its cyanide spill of 1995, but the thousands of “small scale” operations (many of which are nothing of the sort) have received little scrutiny or enforcement action. Not surprisingly, the report identifies two key “structural” impediments to an effective Guyana mining regime as (1) the “winner takes all” political party system with few checks-and-balances and the tendency to undo whatever the predecessor started; (2) the substantial political influence welded by foreign firms and investors. Neither of these are unique in LAC (particularly the Caribbean, it seems), and quite frankly, neither are easily remedied and both will be slow to change (if at all). Two other tough problems identified involve the judicial system and border security. On the former, the reports notes that even when laws and regulations are well-drafted and implemented, bad courts make effective enforcement difficult, if not impossible. When the courts are corrupt, disorganized, backlogged, slow and tending not to deal with cases from the interior, people with grievances about mining operations tend to forgo relying on the courts for justice. Fully implement the 2005 Mining Regulations on environmental protection. Provide Amerindians and other surface rights users with greater rights and control over their land. Amerindians should be granted title to the land they use and occupy in order to give them more control over the way their lands are used. In addition, they should be given an unconditional right to exclude miners from conducting mining activities on their land. Limit or eliminate small scale mining operations. 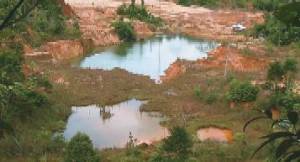 The Guyana Geology and Mines Commission (GGMC) should provide for regulations that prevent miners from leasing several contiguous small scale plots and operating essentially at a medium scale level while still being categorized as small scale mines and enjoying the more lax rules applicable to that status. Provide stricter regulations on equipment as a complement for regulations on mining practices. Equipment is easier to regulate than mining practices. Allow mineral extraction only in areas of rich mineral deposits. Increase the number of mines officers, pay and equip them better, and increase cooperation with Amerindian communities to identify violators. Increase the number and powers of Amerindian rangers. GGMC should train and employ more rangers and give them the same powers as mines officers, including the power to enforce the mining code and collect environmental data. Immediately change the revenue structure to a flat rate rather than a royalty percentage. Promote the education of Amerindians and miners regarding safety in handling hazardous materials (particularly mercury and cyanide), with more on-site training in the interior. Require adequate environmental bonds by miners of all scales, but at rates higher than those currently provided under the 2005 Regulations. Establish additional health facilities in Amerindian territory to deal with mounting levels of mining-related diseases, such as HIV and malaria. Invite the United Nations Special Rapporteur on the situation of human rights and fundamental freedoms of indigenous people to examine the human rights situation in gold mining areas located in or near Amerindian territory. Ensure that pending legal cases involving land claims by Amerindians in mining regions be duly processed in the judicial and administrative system without further delay. In particular, require cases involving Amerindian title to the lands that they occupy and use should be required to be resolved before mining is permitted on said lands. Ratify International Labor Organization Convention 169 (ILO 169) and the American Convention on Human Rights (ACHR). Provide technical and financial assistance to the Guyanese Government in further reforming and implementing the gold mining regime so that it will respect, protect and promote the rights of Amerindians.